Coco, the 2018 Oscar winner for Best Animated Feature, tells the story of a young boy Miguel who idolizes a famous deceased musician and is whisked away to the spirit world on Dia de los Muertos or the Day of the Dead. To honor the ancestors, the families cook their favorite foods, gaze upon their pictures set up on an ofrenda (altar), and tell stories about them. Miguel, even at age 12, knows the stories of his deceased ancestors, spanning four generations prior to his. He knows because (presumably) every year the stories are told. We find out later how key this repeated storytelling is: in the land of the dead, when a spirit is no longer remembered by anyone living, he or she dies a second death and is gone forever. After seeing the movie, my five-year-old nephew asked his dad, as he was being tucked in, if he could hear a story about his great-grandfather. Whether or not you believe the stories behind the Day of the Dead, there is a mythic truth to the central idea: when we remember our ancestors, they do live on. Storytelling is a continually evolving activity: even if you think your ancestors’ stories are fixed in time, actively remembering and retelling the stories may strike you differently as you grow older. Maybe a different part of the story resonates. Maybe you learn new information through research or other voices, which create a new narrative or shift the old one. In Coco, the family narrative is that Mama Imelda, the matriarch of the family, was once married to a musician who ran off and broke her heart. Instead of sitting around, she learned a practical trade (shoemaking) which has sustained the family ever since. She also banned music in the household, as it was a reminder of the man who abandoned his family and responsibilities. By the end of the movie the narrative has shifted based on events and information Miguel has learned in the spirit world. The new narrative allows for more joy and music in their lives. Certainly that doesn’t always happen. Take the controversial Ben Affleck episode of genealogy show Finding Your Roots. While the celebrities on the show often discover new relatives in their trees that they can be proud of and whom they can identify with, in the Ben Affleck episode he discovered he had an ancestor who was a slave owner. Though he understands the significance of learning from that history in the moment, he later requested that the ancestor be edited out. Presumably he was ashamed and didn’t want that fact to affect how people viewed him in the present. But while we’re not responsible for our ancestors’ actions, it is even more important to turn that revelation and knowledge into a teachable moment for the present. We don’t have to be proud of our ancestors or everything our ancestors did for us. But hiding the story helps no one. He could have told the story, acknowledged the shame, and figured out what he could do to ensure that it never happens again. Knowing the fuller story moves that family’s narrative forward in the world. Mama Imelda ignored music, shut it out of the family completely even though she loved it, and it came out in her great-great grandson Miguel anyway. In the end, it’s music that saves this family in the spirit and earth worlds and changes the family narrative. 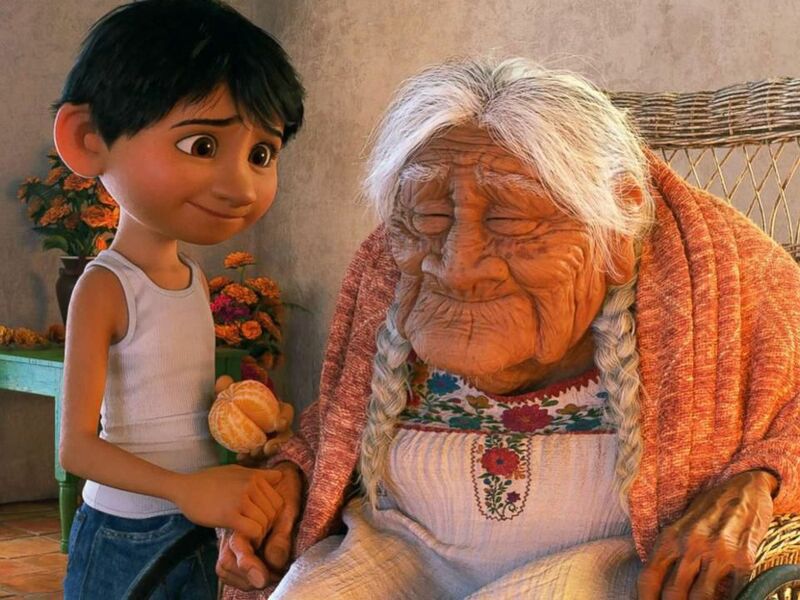 It’s music that brings Coco back to herself and brings out her story which redeems the family. Shutting out that part of the narrative kept the family in the past. As the story evolved, so did the family, into the future.